This species has a blue-teal head that blends into a yellow tail. Black spots are located along the anterior (near the head) dorsal fins, confined only to the soft tissues that inter-digit the fin rays. The common name is derived from a prominent black stripe which originates from the eye and runs longitudinally about half or two-thirds the length of the body, where it becomes a broken line before terminating. Some geographic variants exist. Meiacanthus nigrolineatus is a carnivore of zooplankton and other bite-size invertebrates. Like most members of this genus, they have evolved a stinging bite for protection against predators. They have also evolved bright colors as an effective reminder to predators, who distinctly associate this species with a stinging experience. Interestingly, other non-venomous species have evolved to look like some Meiacanthus species in color and shape, so that predators also avoid them. The Meiacanthus nigrolineatus is mimicked by Ecsenius gravieri who is a harmless herbivore. 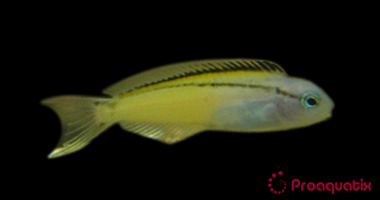 This species occurs in the Red Sea and the Gulf of Aden.